The accepted system for “scoring” a horses weight was developed by Dr Don Henneke in 1983. This system ranks horses from 1-9; 1 being emaciated and 9 being obese. However the system relies not only on visual observation but an ability to palpate (touch) areas of fatty deposits on a horse. The system was developed for domestic horses. In the case of wild horses we have some factors that need to be taken into account when using a “body score” as a justification, or dismissal, for the need to remove them from the range. The most obvious of which is that with wild horses any system would be “observation only” ranking (less accurate). This seasonal body “score” change is seen in most grazers on the range; elk, deer, pronghorn. In really hard winters all species head to where the snow is easier to dig through, usually lower ground. Many times those areas have high stocking of domestic livestock at other times of year and there is not much left for “wild things” in hard times. Wild horses also experience natural physiological and psychological variables usual not present in a domestic population. The cycle of a reproductive wild population creates a seasonal tense dynamic as studs compete for mares. This often results in weight loss in healthy males on a healthy range. Mares that have recently given birth (and are nursing, most often just as new forage begins to grow on the range) also can experience a decline in “score” that does not indicate an unhealthy individual. If there was a recent roundup and a lot of disturbance it is not unusual to see stallions drop weight as they try to rebuild their harems (family bands) and have to fight with other males. Domestic horses have the benefit of additional feed in colder months and supplements during times of physiological stressors. To assume that a wild horse would look like a domestic at all times of the year as an indicator of stress is illogical. Factors such as breeds associated with each individual Herd Management Area (HMA) must also be a factor in observational scoring. Our wild herds are influenced by many breeds specific to “the land where they now stand,” and this makes them truly a living monument to regional histories. As an example an area influenced by thoroughbreds would have a more prominent withers than one heavily influenced by the Quarter horse. A handful of older horses in a “score” of 2/+ in a herd of 100 horses is not an indicator of overall herd health, particularly coming out of winter (note in winter heavier coats make observational scoring more difficult, but not impossible). However the opposite holds true as well. When more than half of the horses observed are in a score of 4 and winter is just beginning, rangeland health must be seriously evaluated. Rangeland health involves multiple factors that most often have at the root cause an historic overuse by domestic livestock, drought, fence lines and other surface disturbance that inhibit distribution of wild horses throughout their Herd Management Areas (HMAs). Very rarely have we ever seen an HMA that is considered “over populated” utilize more than the forage allocated for their use mathematically (Appropriate Management Levels, or AML, has not historically been based on any real sound mathematical equation). There are major problems with the way forage is allocated on our western landscape, but that is another article. So when you are out observing wild horses, or watching reports from roundups come in, please keep in mind that a “body scoring” must be filtered through the world of the wild horse before you use that as a baseline for assumption. Know the herd, ask questions and understand the cycle of the range. Without those factors considered body score alone, by domestic standards, is not a reliable measure of herd health. There are many variables that need to be considered in evaluating a herd. 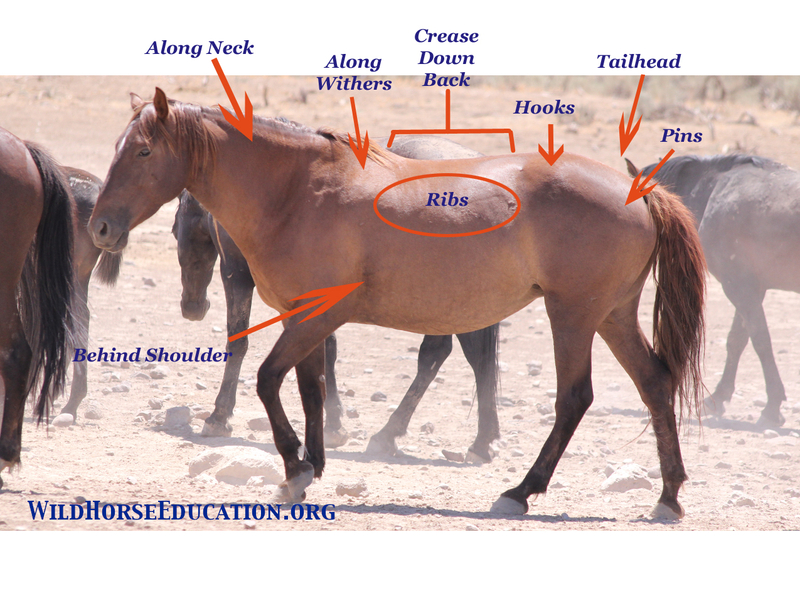 However, keeping body score charts (with notations on individual horses) monitoring the changes to individuals over time, to the multiple stressors wild horses experience in the wild, is a valuable tool. Below is the scale developed by Henneke. 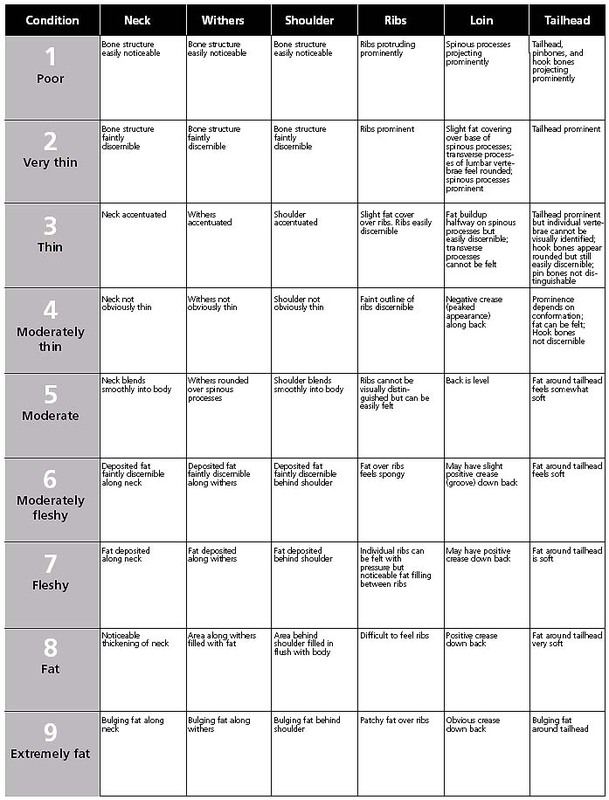 chart used from River Road Veterinary clinic http://riverroadveterinary.com/the-henneke-body-condition-scoring-chart/ and is provided as reference for the above discussion. We are working on a photographic seasonal reference chart.